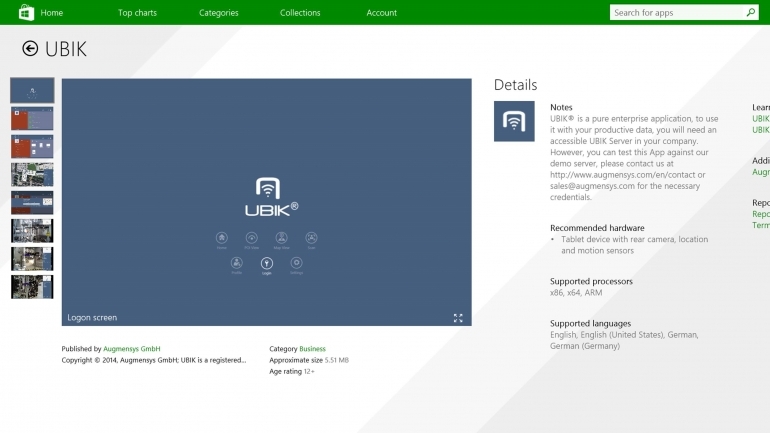 The cooperation between Augmensys and Microsoft is still very young, but it already produced a very important result: the Windows 8.1 client of UBIK® passed its certification last week and can now be downloaded from the Microsoft Store. This marks a big milestone, since the spectrum of possible applications in industrial environments increases exponentially with the steady-growing number of devices that leverage the new Windows platform. With this release, the integration of a modern mobile solution [UBIK] into the corporate infrastructure will be as easy as buying a new notebook, because all well-established enterprise IT-directives will also apply on the new devices – the risky bridge-building between different worlds, just to get mobile, will soon be remembered as a piece of history. UBIK on Windows 8.1 has the potential to help industrial mobile data management leaving its childhood behind: mobile data is no longer something special, causing irritations and headaches in IT departments, but just the logical expansion of certified and maintainable standards to new form factors. Approach us for a demo login and experience it live on your Windows 8.1 mobile device! SAP-Forum 2018 – Discover the Universe!